Room monitoring requires a small but powerful audio transmitter. Latest technology and consequently low current consumption allows up to 15 hrs continuous surveillance operation. Only by implementation of SMT (surface mount technology) its extremley small dimensions could be achieved. Metal housing manufactured by rotary-grinding from one metal block provides excellent emission characteristics. The placing of a bug has to happen very quickly. 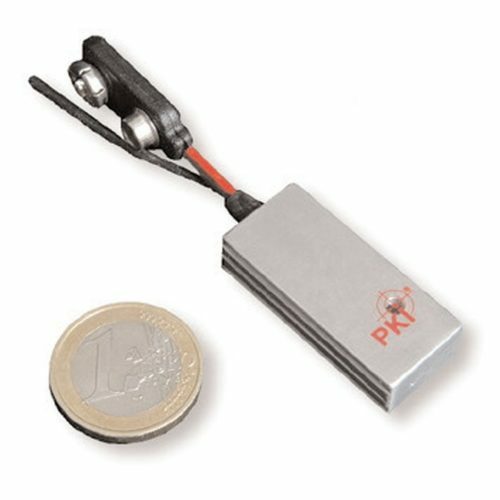 The PKI 2205 room transmitter with its external power supply solves the problem, because only the external battery has to be connected and the unit is ready to operate. The PKI 2205 Room Transmitter is available in standard frequencies within UHF band. VHF, SHF or spezial frequencies are available on request.